For the best varieties of tomatoes available every home gardener should try growing them from seed. Its cheap, they are tasty and you will also have a sense of achievement. So you to can have a huge crop of Roma tomatoes grown from seed as is pictured right. Tomatoes are one of the most widely grown vegetables in the home garden and are relatively easy to grow from seed. A large variety of tomato seed are available for purchase online, or you can collect seeds from your favourite tomato plants each year and save them for planting the next season. Tomatoes require sun, humus rich moist soil and good air circulation to produce good crops. 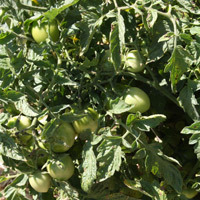 Tomatoes can be grown in the ground, in pots, or hydroponics. With a wide range of heirloom tomato seeds available growing tomatoes from seed is a rewarding experience. Seeds can be started in seedling trays or pots indoors or in a greenhouse 2 months before the last frost. Sow seeds at a depth 2-3 times the diameter of the seed either in individual pots or in larger trays. Keep moist and warm, make sure pots are placed in a well lit position. When ready to transplant to larger pots, simply separate seedlings and 'pot up', stems can be partly buried for additional plant strength as tomato plants will simply put on extra root growth on buried stems. Transplant seedlings to the garden and keep well wate red, most tomato plants require support, use a tomato cage or stakes. Pictured right we have an heirloom variety 'Stupice' started from seed indoors and ready to be planted out into the garden. Prepare the soil in a sunny position, dig in well rotted compost and some cow manure. Place stakes 24inches apart and the plant seedlings at the base of each stake. Water in well with a liquid fertilizer or compost tea. Pinch off the lower leaves from the seedlings when they are 6 - 8 inches tall. 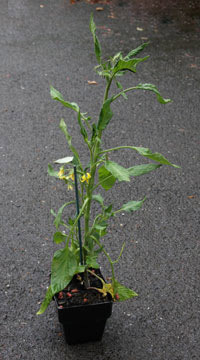 Tie tomato plants to the stake as they grow for support. Mulch tomato plants to help retain moisture and prevent weeds. Try to keep moisture levels even, tomatoes do not like to dry out, and they do not like to be waterlogged. Avoid fertilizers that high in nitrogen, nitrogen promotes foliage growth, you want fruit, so look for fertilizers that are balanced or high in phosphorus. We use liquid fertilizers once every two weeks. A charitable organization dedicated to the health and vitality of the earth through the preservation and promotion of heritage seeds.